I've been fascinated (as have many people lately) with the green roofs that are quickly become very popular. 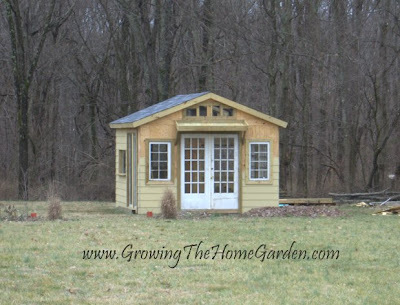 Originally when I wanted to build my shed I wanted to cover the all of the non-transparent roof surfaces with plants. I realized that to build a greenroof over the whole structure would be both time and labor intensive. I would have also needed some restructuring inside to compensate for the wight load of wet soil. 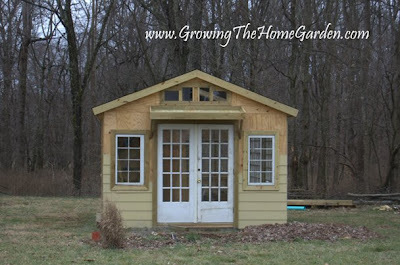 In short it just wasn't practical for my greenhouse shed. But I'm never one to give up on an idea quickly! A couple months into its construction I had an idea ...why not try a decorative front door overhang? Then I thought "why not make it a greenroof?" Today I completed the basic structure of the greenroof overhang. It protrudes 2 feet out from the greenhouse and is about 6 feet long. It's only about 4 inches deep which should be more than enough room for succulents and rock garden plants. I attached 2 - 2"x4" pieces that were cut 2' long (one side of each board was cut with a 13 degree angle) to a 6' long 2"x6". Then I put the 2"x6" on the greenhouse and centered it. Underneath the two sides I attached support pieces to help hold the structure. Next I put the edge trim pieces on both ends which measured 24" and covered the front with another trim piece. Inside the frame I put 2"x2"s along the bottom edges of the long sides of the frame. Last for today was putting the floor of the overhang together by screwing it into the 2"x2" pieces. The flooring was made from pressure treated dogeared fence panels that I cut at 23.5". It was a cheap and economical way to put the floor together and looks pretty good from underneath. To finished the green roof section I need to put down a waterproof membrane, drainage spout, a capillary layer and of course the soil! I would also like to add some more decorate aspects to the supports and the area in general. My next step is to figure out the best soil mix for green roofs, one that retains moisture yet stays relatively light. Time to do some research! I love your idea! 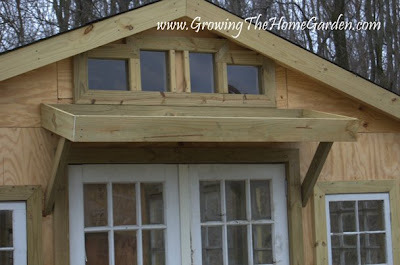 I've been hoping to do our shed roof, but wasn't sure how to go about it. Now I do! Thank you!! Great idea! You may consider a baffle in the middle because after it rains the soil will try to level out and may all wash down and off the front. The baffle (ponding element) will also allow water to be throughout the growing area instead of just at the bottom edge. Here's a link on the soil medium usually used to keep the roofs lightweight and to keep the soil from wicking all the moisture out in the air. Good luck it looks great. I hope to eventually build another smaller shed (not this year) for just the mowers but I would like to try a greenroof on it! Little danger of that right now, the girls like plants - I'm raising them right! The baffle sounds like a good idea and thanks for the links to the soil info. I'll plan on putting in a baffle after the water proof layer. I can't wait to see it in action! box. Does it make sense to use Ice and water shield and then pond liner? What do you mean by baffle how to incorporate that? MOre details on wood structure would help me as I am a visual person. Thanks How is it holding up, where do you live is it feasible in MI.